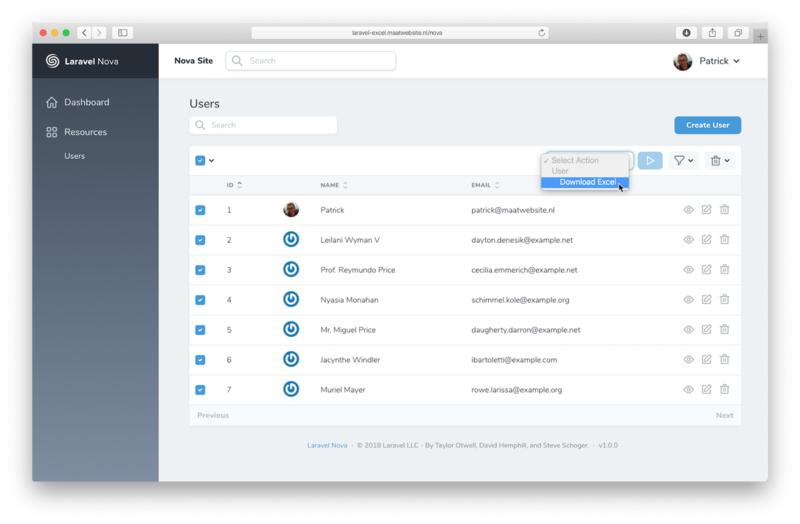 Laravel Nova Excel integrates Laravel Nova resources and Laravel Excel seamlessly. Integration is as easy as adding one class to your list of resource actions! Before integrating this package, make sure you have Laravel Nova installed. Then install maatwebsite/laravel-nova-excel via composer. This will download the package and Laravel-Excel. Go to your Nova resource. As example we’ll use the app/Nova/User.php. 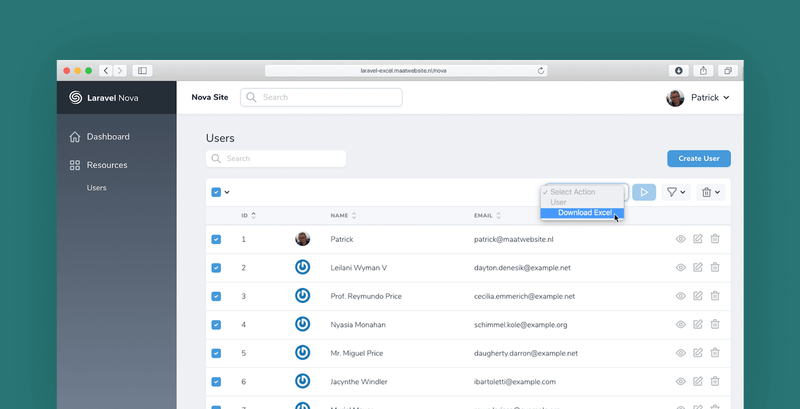 Add Maatwebsite\LaravelNovaExcel\Actions\DownloadExcel action to your actions() list. Go to your resource in your Nova admin panel, select all or some users and click “Download Excel”. In your downloads folder you will find your users.xlsx! The name of the file is auto-generated based on the plural form of the resource name. But of course this is fully configurable! Prefer your customer to choose the filename themselves? No problem! Use the askForFilename method to prompt a question after clicking “Download Excel”. As Laravel Nova Excel delegates all the heavy-lifting to Laravel Excel, it’s also possible to customize your entire export.